Update: PCH confirmed that this note was not for a new Nikon product, but most likely for the release of the new 24-70mm f/2.8E VR lens. 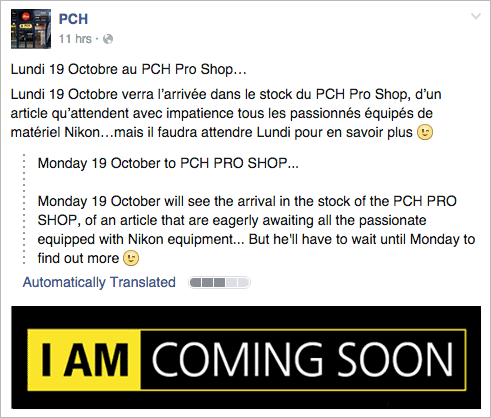 The Belgium store PCH posted on their Facebook page that new "Nikon equipment" will arrive in their store on Monday. As I already mentioned, a Nikon announcement on Monday makes a lot of sense - right before the PhotoPlus Expo in NYC (October 21-24, Nikon is at booth 401). I do not expect this to be a major announcement - maybe a new flash, new Nikon 1 products or Coolpix cameras. The "serious stuff" (D5, etc.) will be announced in early 2016. Of course with Nikon there is aways a chance for a surprise, but the rumor mill has been very quiet in the past few weeks. The PCH store in Belgium is known to have reliable information prior to an official product announcement - just few days ago they published pictures and sample photos of a not yet announced Fuji lens.